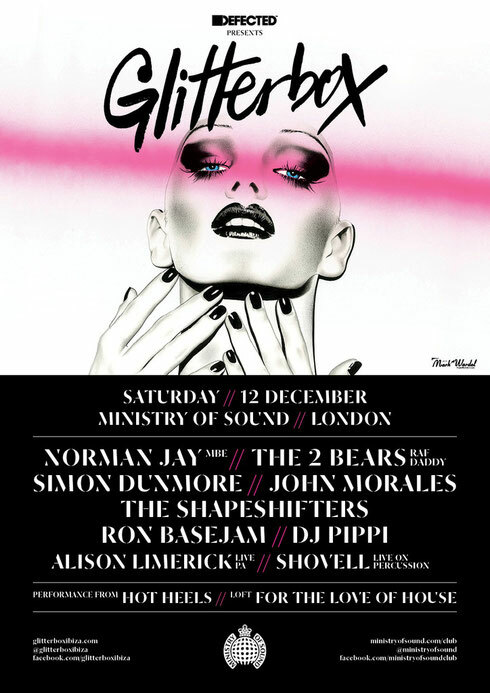 Glitterbox makes its return to London’s Ministry of Sound on Saturday 12 December. The show once again welcomes an eclectic mix of established DJ talent, all of whom are given free rein to dig that little bit deeper into their respective record collections. Norman Jay MBE, The 2 Bears, The Shapeshifters, John Morales and DJ Pippi have all apparently received rave reviews for their respective Glitterbox sets at Space Ibiza this year, whilst Defected founder Simon Dunmore is possibly one of the most essential selectors of his or any other generation. Making his Glitterbox debut, Crazy P’s Ron Basejam is known for sets that span disco, funk, house and everything in between with a heathy dose of the productions, remixes and edits for which he has established himself as an artist. Proceedings elevate with a live appearance from the Alison Limerick, who will be performing amongst others the iconic, Frankie Knuckles-produced ‘Where Loves Lives’, as well as M-People percussionist and renowned drum warrior Shovell. Finally, The Loft hosts the For The Love Of House DJs where Greg Sawyer and Simon Dawson who will be spinning classic house all night long, paying homage to the records that have helped define the scene over the past 30+ years. The Savage dance crew, Hot Heels, will be out in force, with live dance shows and dancefloor debauchery adding the final sparkle to Glitterbox’s atmosphere. Accompanying the party, a new mix album ‘Defected Presents Glitterbox London’ will be released this November. Mixed by Simon Dunmore and featuring some of the most inspiring artists from the last 40 years of dance music, including Gwen Guthrie, First Choice, Patrice Rushen, Donald Byrd, Blondie, Breakbot, Moloko, and Purple Disco Machine, the new London edition is packed full of both Glitterbox anthems and hidden gems, and simply shimmers from start to finish.